On Cesar Chavez Day, Workers Make History: $15 minimum wage headed to the Governor for signature! Historic legislation to raise the wage in California to $15 an hour would be an economic boost to workers and California’s economy, according to a new study released by the UC Berkeley Labor Center. According to researchers, slowly hiking minimum wage to $15 would benefit 5.6 million Californians. Why CSU Faculty Are Ready to Strike! California State University (CSU) faculty and students marched to the state Capitol this morning to rally for fair pay for salary and investment in the CSU. The California Faculty Association (representing CSU professors, lecturers, librarians, counselors & coaches) have been fighting for a fair contract for over two years. Their potential strike dates will be April 13-15 and April 18-19 if the statutory process fails to produce an agreement. Check out the video below to learn about their fight and why they are willing to go on stike! The Trans-Pacific Partnership sets up private “corporate courts,” with few rules, that are only open for multinational companies to sue countries. Nearly all the winnings in these “corporate courts” go to the world’s biggest corporations and richest people—and most of the rest goes to the lawyers who work in these tribunals, according to a new study. Dolores Huerta worked for decades to improve conditions for some of our country’s most disadvantaged workers. As we celebrate Women’s History Month by recognizing the women who have helped build the American labor movement, few are more worthy than this living legend. 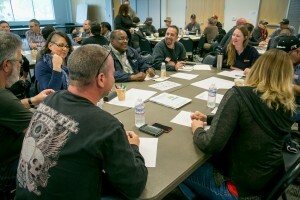 More than 500 union members, leaders, and activists met in Sacramento this week to plan and execute a shared agenda to raise standards for all working people in California. The conference theme: Union Strong. In California, Union Strong means a path to the middle class and the American Dream for all. This is just one of the tough questions that 60 IBEW 1245 public sector member-leaders tackled as they prepared to launch a new member-to-member educational drive to push back against the growing attacks against public sector unions.